CPR, Healthcare Provider CPR, AED, First Aid, Advanced First Aid, Oxygen Administration, Bloodborne Pathogens, Instructor certification and Registered Nursing Consultations. I Know CPR, Inc. offers on-site CPR, AED, First Aid and Bloodborne Pathogens training to the general public, industries, and health care providers. Our highly qualified instructors will teach you all of the latest lifesaving techniques. Registered nurse instructors with over 27 years of health care experience started I Know CPR to provide proper CPR and First Aid training to anyone that wants or requires training for their occupation. For your convenience, we provide training at your location and offer competitive rates. To complement our CPR training classes, we offer sales of Automated External Defibrillators or AEDs. This compact but high-tech equipment is essential for any facility that wants to house the latest in lifesaving devices. 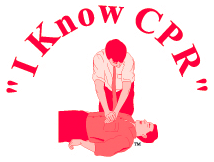 Learn the right way to perform CPR by contacting us at (360) 651-7502 or info@iknowcpr.com. Serving Western Washington including: Tacoma WA, Bellingham WA, Marysville WA, Everett WA, Bellevue WA, Seattle WA, and other cities in the Puget Sound area.